Studio - Paradise Tattoo, Inc.
"Simply the Best Place to Get STUCK!" Don't be fooled by similar logos or names. 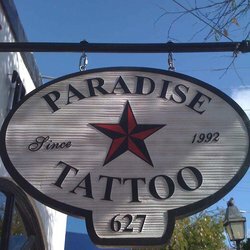 Paradise Tattoo, Inc. has always been the "Premiere Tattoo and Body Piercing Studio in the Florida Keys" opening in 1992. Welcome to Paradise Tattoo, Inc.
the "Florida Keys Largest and Cleanest Studio"
Established in 1992, we are also the Keys first and oldest studio in the Keys. Our experienced tattoo artists will work with you on creating a custom design, or will help you choose a design from one our extensive sources of tattoo artwork. Designs are truly limitless. Studio minimum is $75. All tattoo work is priced individually NOT by the hour. Check out the "tattoo" page for our Resident and Guest Artists work. We have the largest selection of body jewelry in the Keys. We provide services for all types of body piercing and Dermal Anchors, by our FDOH certified and experienced piercers. For a list of piercings we offer, please visit the "piercing" page. All our work is carried out according to Florida Dept. of Health standards. To talk to our studio staff, call 305-292-9110 or book an appointment online. © 2014. Paradise Tattoo, Inc.. All Rights Reserved.